I saw this project on Pinterest and had a friend who tried it and I loved her results, so I decided to give it a try myself! I am so pleased with the results that it has earned itself a spot on my wall! If you want to try it, I will give you a list of all the things I used to complete the project as well as the steps I used. Below is a picture of all of the supplies I used. 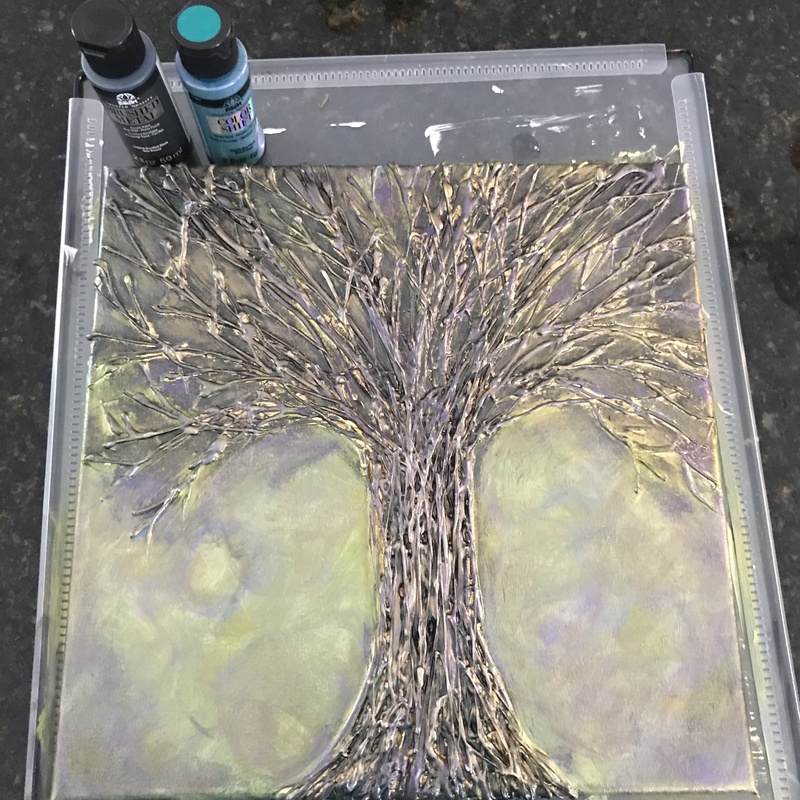 I started with my large tipped hot glue gun and made a line from the bottom of the tree to the top of the canvas on both sides. 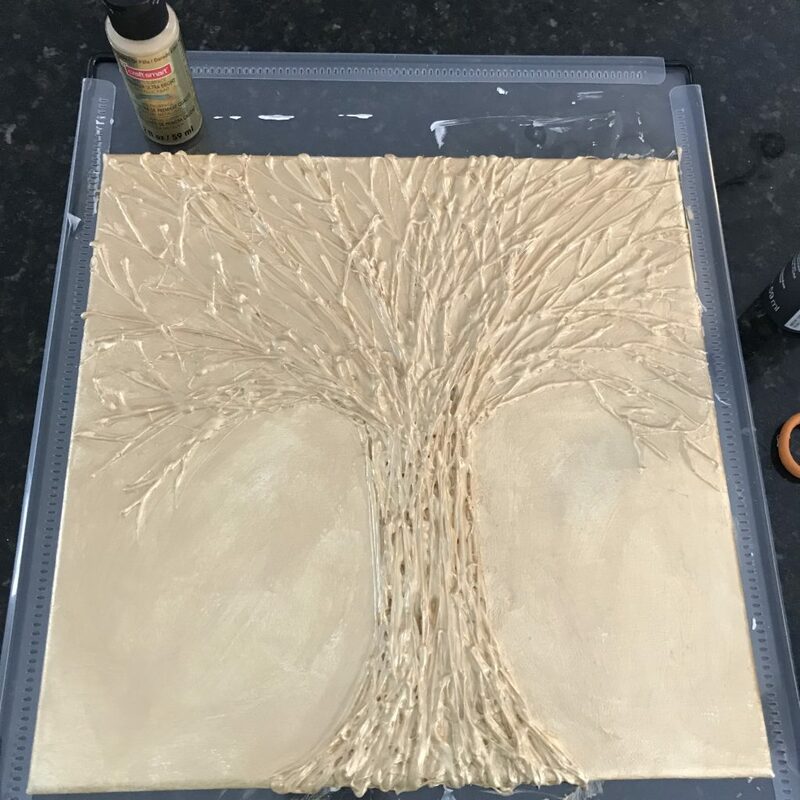 Then I filled the trunk in using vertical lines of hot glue and extending some of the glue lines up and out to make the branches of the tree. Once you get a good base of larger branches you can use the small glue gun to make smaller off shooting branches off of the big branches. You can make as many or as few branches on your tree as you want. 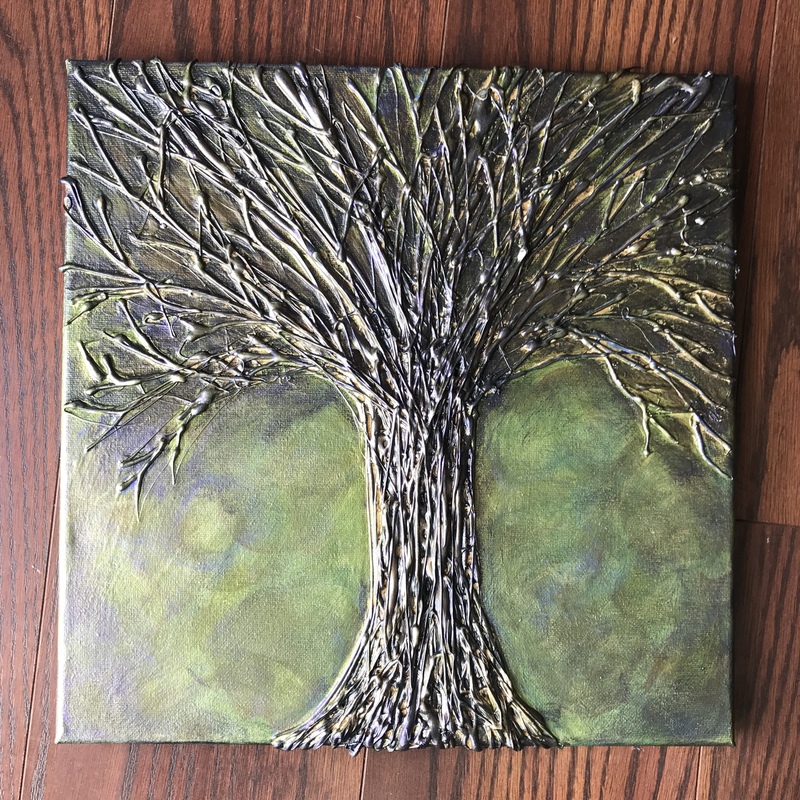 I wanted there to be lots of gnarled together branches so I used lots of glue lines. 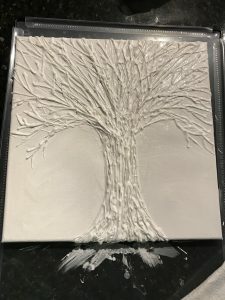 I used the small glue gun to also make lots of bumpy texture on the tree trunk like a real tree has lots of bumpy bark. This is what it looked like when I was done with my glue tree. 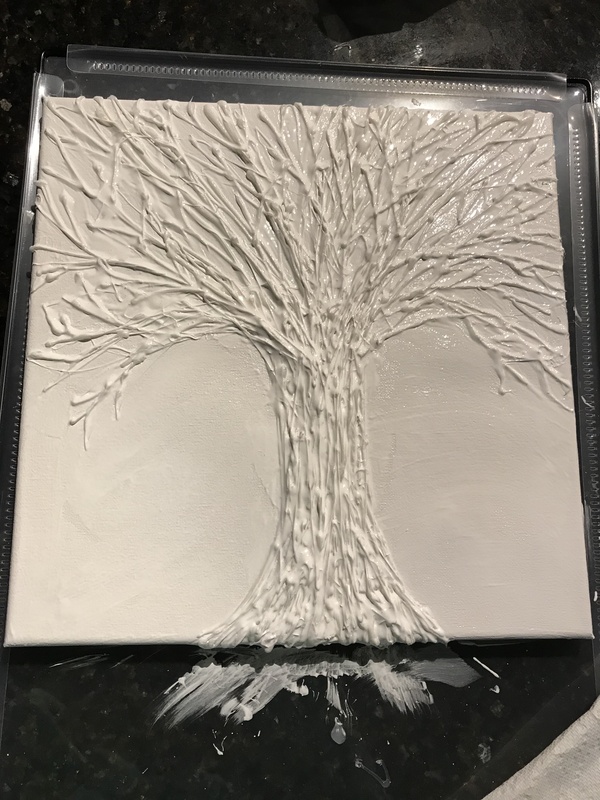 You want to get a really good coating so use your big paint brush and make sure it gets down in your cracks and texture of your glue tree. Once it is totally coated, let it dry. I let mine dry overnight. Don’t forget to wash your paint brushes out in between steps! Now the fun part! We paint! The first coating I did was the gold. I used the large paint brush to add in the gold. I just poured some of the paint from the bottle directly onto my tree for this part since I was coating it pretty heavily. 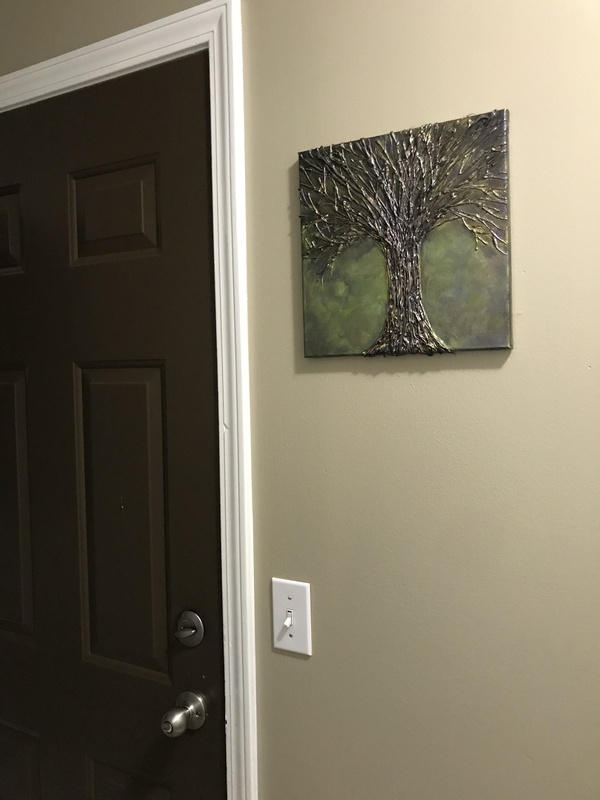 I painted it all over the tree and the rest of the canvas as well. I coated the tree pretty heavily getting down into most of the cracks of the glue. The blank part of the canvas I just used a random swirling motion rather than just straight strokes. Then I let this coat dry for a couple hours. I first added the green with my round foam brush. 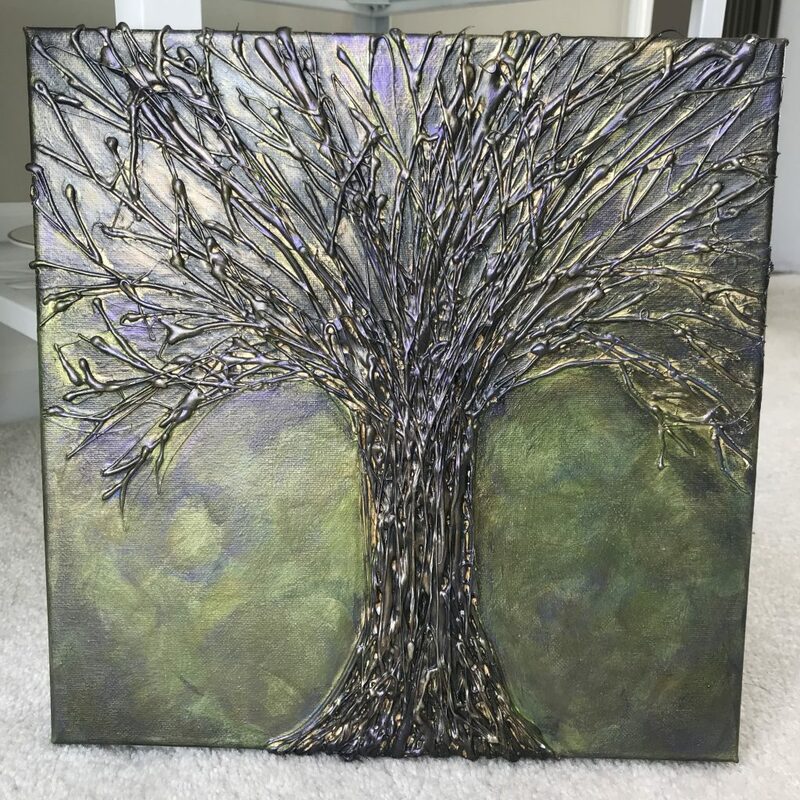 I added the green all over the tree and over the canvas background. 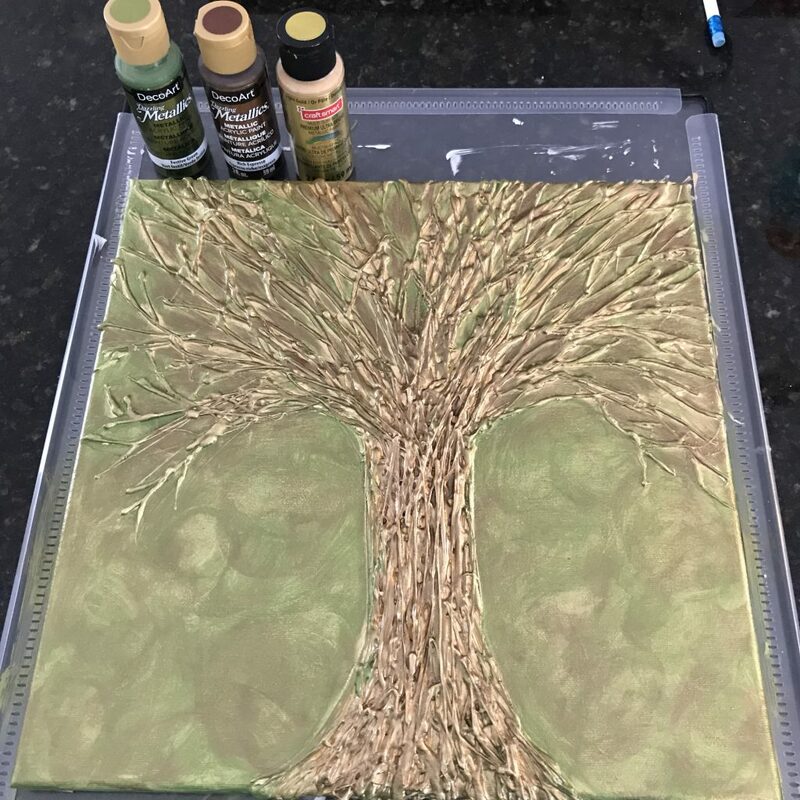 I really pressed the foam brush down over the tree branches because I wanted the green to look like it was more behind the branches. Again, on the canvas background that wasn’t the tree I just used a swirling motion. I also added the metallic brown paint in this step as well. I didn’t wait for the green to dry before I added the brown. I added the brown mostly just over the trunk and the branches of the tree. The branches I just tried to add it lightly with the foam brush so that I maintained the green in the background and just got the brown on the raised branches. After, I was done with these coats I let my piece dry for a couple hours. Don’t forget to wash your brushes out with water in between steps. The last step!!! I used the foam brush again and just added black over the trunk and over the branches. Then I used a paper towel before it dried to wipe it off so the black was mostly just in the cracks. Then I added a little black around the corners like a vignetteing effect. The last thing I added was the color shift blue metallic looking paint. For this coat I used the foam brush and just used a swirling motion over the non-tree part of the canvas. Then I added just a slight layer of the blue over some parts of the tree. That’s it! It was easy, it was fun, and I was super happy with my results! I’d love to see what you come up with if you try this out! Post your pictures to our Pancake Presents Facebook Page! As an Amazon Associate, I earn from qualifying purchases. If you buy through the links on this page they are affiliate links. That means I make a small percentage of the sale, but you are not paying anymore money by buying through the links. Thanks for your support.